One of the best ways to take in the local culture of Laos is to join a half-day cooking class led by talented Laotian chefs. The traditional food seems to be strange but soon becomes more impressive than ever because you have the opportunity not only to taste it but also to prepare it. Getting a real taste of Laos with a cooking class is never a bad idea for food and culture lovers. If you are seeking for amazing places to experience the culture of food during your visit in big cities in Laos, this article is written for you. Normally in the South East Asia countries, the most well-known cooking classes come from Thailand as a heaven of street food or Vietnam for its stunning cuisine which is so popular around the world. 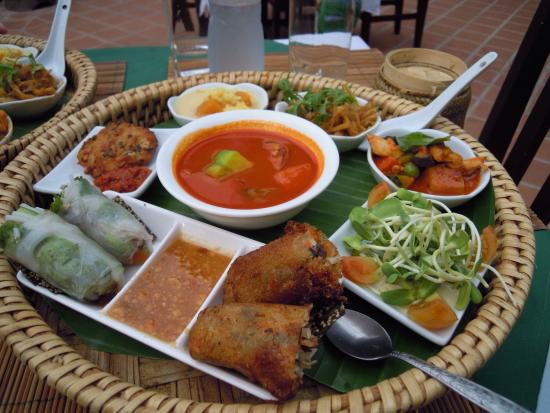 However, Laos food is proud to bear unique features that you can hardly find anywhere outsides comparing to its neighbors. 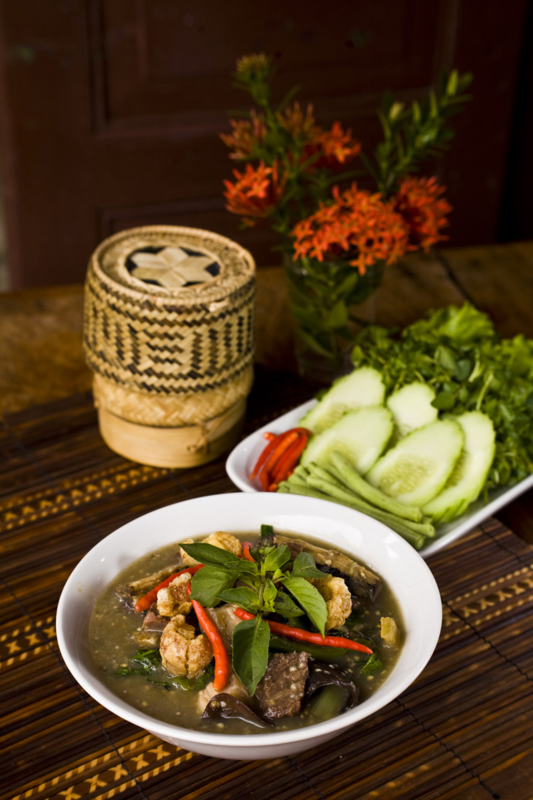 “Fresh” is the most distinctive feature of Laos cuisines. 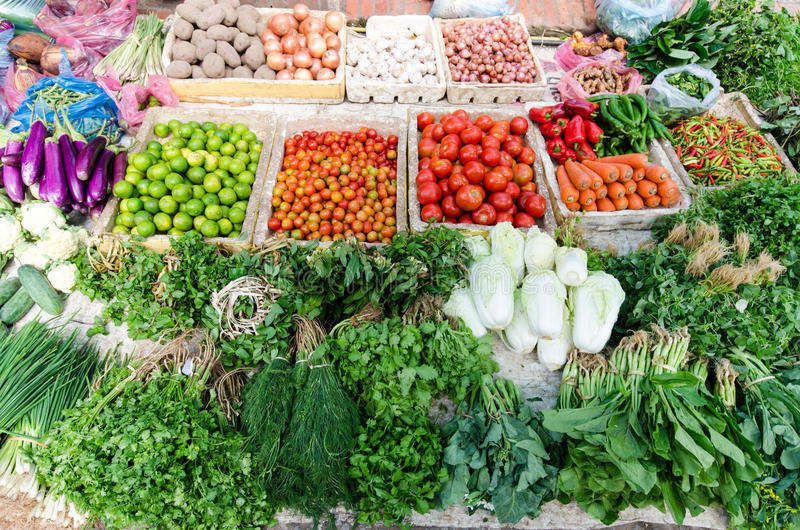 Having a chance to enjoy a meal in this country, you will find it surprising that Laos meals always serve a big quantity of fresh raw vegetables and herbs making the dish green and low in fat. One more difference that you will find it so much fun is Laotian believe that: “sweet makes you dizzy; bitter makes you healthy” so sweet flavor is considered as the most unwanted for almost dishes, meanwhile, the bitter taste can be found frequently for using mint and dill which are favorite green herbs for Laos eat. Another distinctive characteristic of Laos food or Laos eating habit is that food is traditionally eaten with sticky rice using your fingers. The habit must be the result of the fact that food is served at the room temperature. Since having been established in 2014, the Bamboo Tree Restaurant and Cooking class is a highly recommended school in town. 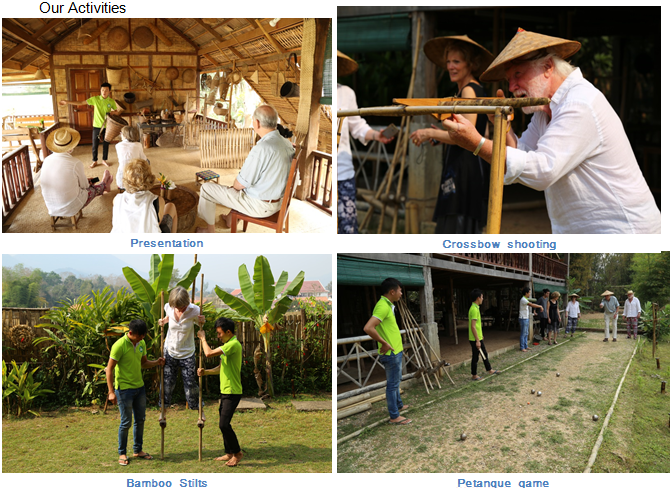 Following the same process of a typical cooking class that you meet across Asian countries, Bamboo Tree’s friendly and professional chefs will take you to the local market not to buy for a fixed set menu but to choose your own favorite dishes among a list of available 20 dishes of the cooking school. Many tourists admitted that they fall in love with laap and mok pa that they prepare by themselves under the clear and detailed instructions step by step from the sister chefs. Madam Phasouk cooking class is a family run class guided by Ms. Phasouk who had a 15-year experience as a cooking teacher at a hotel. People get amazed to know Ms. Phasouk is a brilliant and successful lady who can speak not only Laos, English but also Russian and French. 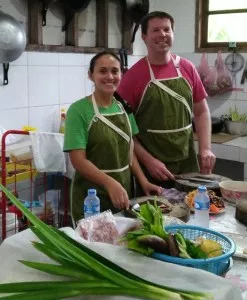 The experience of being welcomed at a local home like your family rather than a professional cooking school attracts many tourists coming back. After being picked up by Ms. Phasouk at your hotel, you can start the session by visiting a wet market to get familiarized with various Laos ingredients and buy the necessary ones to fit your diet whether you are a meat lover or a vegetarian then you are fully ready to come to her home to prepare such an enjoyable meal. Ending the cooking class with a delicious meal and cultural stories, you can also bring home a note of recipe that Madame Phasouk prepares for you so that you can make Laos food when back to your country to treat your beloved like a real Laotian. 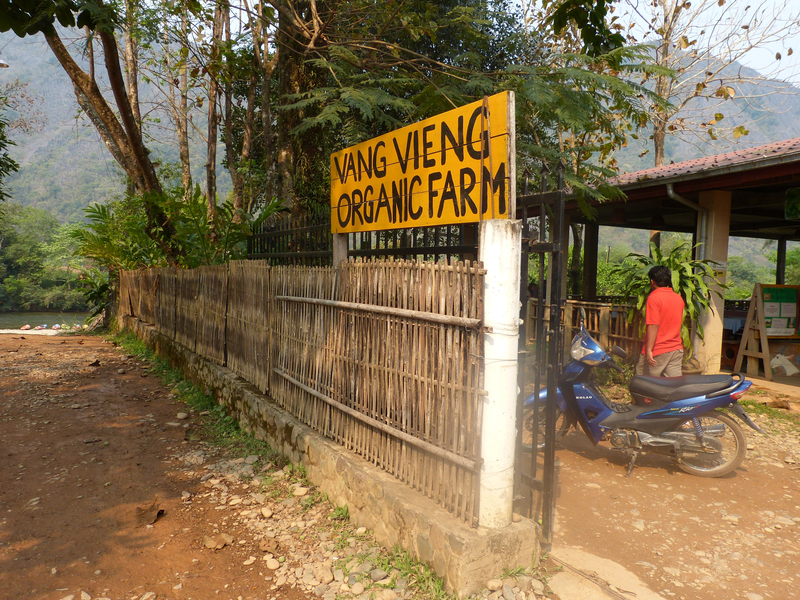 Vang Vieng is a famous stop-over point for backpackers & adventurers on their trip from Vientiane to Luang Prabang so finding a cultural place for food lovers is quite limited. However, you can still go cycling or a tuk-tuk out of town to the Organic Farm to do a cooking class using ingredients from the farm. With a maximum of 4 people join in the cooking class, you will have a chance to master making a meal of 3 main dishes and 1 dessert by Mr. T – the owner’s informative instruction. A warm and cozy welcome place is actually an ideal hub to escape the busy party place in Vang Vieng. If your time permits, why not trying to relax for a night and become a real farmer here? It’s not easy to exactly describe this dish. There’s also no official name for it in English, but it is a dessert that similar to the Tangyan of Chinese. 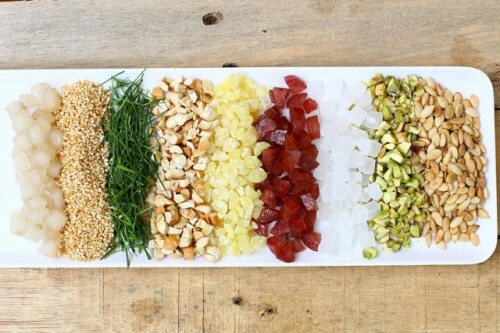 The word ‘troi nuoc’ means floating on the water. In a small bowl, there are two balls with the same size of the egg, made from glutinous rice flour mixed with a small amount of water to form balls, one stuffed with the green bean paste, another with black sesame. The balls are bathed in a sweet brown liquid made of water, sugar and grated ginger roots, garnished with peanut and coconut milk. The liquid is always kept warm in low heat. This dish is perfect for a light dessert or a snack in the mid-afternoon on a cold rainy day. You can find the famous food stall that serving this dishes in the Old Quarter at No. 1, Bat Dan Street. This dish is kind of weird with Westerners. In a large bowl, slow-cooked non – glutinous rice flour or corn flour is served with savory ingredients such as ground pork, grilled ground shrimp, mushroom, fried onions, fried tofu, Vietnamese coriander, sesame seeds, salt, peanuts, lime juice and soy sauce or fish. Local people can eat this dish throughout the day – for breakfast, lunch or as a snack. It is the favorite dish special for the elder because of the soft texture and mild flavor. The best place to taste this dish is at a small stall in the alley of Le Ngoc Han Street. You can find these simple dish almost anywhere in Hanoi. Just simply the fresh corn or sweet potato, grilled on the hot charcoal but its good smells seduce local people in the cold and dizzy winter night. The sellers might have another job at the daytime and in the evening, they spend some hours on the street for extra income. They serve the people who have to work late or on the night shift. It’s only 30-50 cents for a corn or potato, but in the freezing day, people seem to be closer when sitting around the fire to enjoy the sticky, hot and sweet grill corn or sweet potato. What a healthy snack for a beautiful sleep in the winter night! The best Banh Mi (mixed bread) in Hanoi. Hanoi is full of iconic foods, and of all the wide range of street side dishes, Banh Mi is still the tastiest and a must-not-miss one. Choosing the best Banh Mi to try while you are in Hanoi can be overwhelming, scrolling through all those recommendations and mouthwatering pictures would take years. And seriously, you are passing by as a visitor, the best experience is what you are looking for. 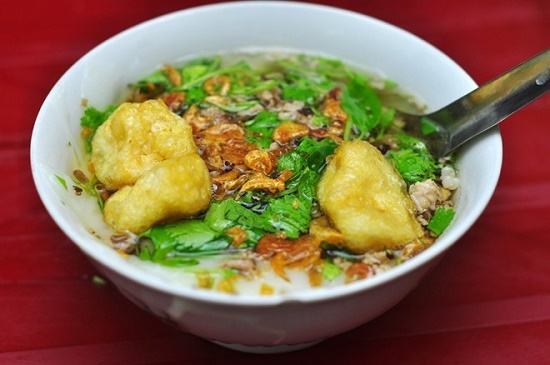 You can always enjoy this dish when doing a full day trip around Hanoi city with Indochina tour our tour guides are the local resident and they know best where to go and the following are some examples. Situated at the corner of small Dinh Ngang and Cua Nam street, the bread shop looks simple but has been around for more than 20 years. Its specialty is Banh Mi Thap Cam (mixed bread), with a bunch of ingredients stuffed inside: a slice of pâté, a fried egg, Vietnamese ham and pork skin sausage, and cucumber all slathered with the store’s signature sauce. Having all the ingredients handmade is exactly the way that makes Banh Mi Dinh Ngang unique. Geoffrey Deetz – a chef and Vietnamese food expert who’s been living in the country for nearly 15 years – is the owner of this baguette shop. The article “Is the banh mi the world’s best sandwich?” by David Farley on BBC described this loaf of bread as follows: “The banh mi sandwiches in Hanoi are much more one dimensional than other parts of the country […] But so many things in here have a function: the pork floss soaks up the sauce, the pate adds moisture and the fact that the baguette is lightly toasted keeps it from getting soggy in this immense humidity”. David also commented the “banh mi” has always been the one kind of food he liked better outside its home turf. Established in 1979, Banh Mi Ba Dan is one of the oldest bread stores in Hanoi. Ms Dan’s son – Mr Binh – is now the owner of the store, and he has managed to maintain its reputation among locals as well as travelers. According to him, back to the old time when Ms. Dan still operated the store, it was a norm that a thousand of bread sold out each day. Nowadays, with the rise of bread stores all over Hanoi, thought the sale went down, still the true Hanoian enjoy its original taste of Ms. Dan’s bread. Beside the traditional paté, the uniqueness of Banh Mi Ba Dan is also the freshness of the baguette. New loaves arrive from the bakery every three hours, this means the baguettes in the store are always crunchy and fresh. In Vietnam, Banh Mi is actually an everyday ordinary dish, banh mi stalls and carts are everywhere on the streets, providing simple and delicious energy for breakfast and midday meal. From the familiar food for Vietnamese people, it is now, proudly, an obsession for foreign travelers and appear in almost street food tour in Hanoi. To the major foreign tourists coming to Vietnam scenery, people and culture are not the sole charms; food, or in particular, street food is another aspect that makes the country stand out. Perhaps street food is simple as it looks but no one can deny its attractive flavors. Sweet-roll or Bo Bia Ngot is one of those and it is especially well-known among young students. When it comes to Bo Bia, it reminds Vietnamese people of their childhood every time school finished, the hungry stomachs would rush out to the school gate looking for the old men or women selling this special gift on their bicycles. As time passes by, Bo Bia becomes a popular street food that is not only sold for students but it appears in many other places as well. Sweet roll has its root in Fujian and Teochew (Guangdong) China. Nowadays, this food can be seen in Taiwan, Singapore and Malaysia and Vietnam. In Guangdong, it was originally eaten in Grave Visiting Festival in spring. However, hardly anyone knows exactly when the food was brought into Vietnam. The South part is the very first place for Sweet Roll, especially Ho Chi Minh City. It is told that around more than ten years ago, there was a man from Vinh Phuc Province (a province near Hanoi capital) came to Ho Chi Minh city to earn a living, somehow he could learn how to make the roll. Then, he moved back to Hanoi and started selling this type of food and spread the recipe to many other people. Main ingredients of Bo Bia Ngot are very easy to find anywhere including rice paper, shredded coconut, pulled sugar and black sesame seeds. 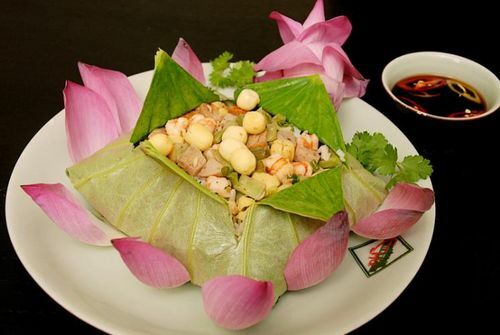 The rice paper or crepe wrapper in Bo Bia is made from wheat flour and a little sugar but it is different from one in normal Fresh Spring roll. The crepe must be absolutely thin and a little tough at the same time so that it can wrap all the things inside. As for pulled sugar, it is candy bar made from malt and is really crispy. Coconut must be shaved from mature coconuts so that it can be crispy as well and more buttery. Just a small sweet roll with few ingredients inside is a perfect combination: sweetness and crumbliness from candy bars, buttery taste from coconut and black sesame seeds. It takes less than one minute to make a small lovely sweet roll but when eating, we should have one bite at a time in order to feel every flavor. Normally, Bo bia ngot sellers can customize according to buyers’ preference. For me, I am always keen on putting more coconut and black sesame seeds. If you are a sweet tooth, you should have more of candy bars. Until now, Bo Bia is still one of the most favorite street foods for every younger or students, for that reason, we can find plenty of Bo Bia sellers in primary or secondary schools or even near some universities. Moreover, in big cities like in Hanoi, Bo Bia can be found around Hoan Kiem lake area or Thanh Nien Steet near West Lake. A special thing about Sweet Roll is that you cannot look for them in a proper shops or restaurants with tables and chairs but on the streets outside. Sweet Roll sellers usually ride their bicycles with hand-made white cupboards writing Bo Bia Ngot on these. For only 10.000vnd, you already have one big or 2 small pieces of Swett Roll. Look inside a small sweet-roll. You just have to spend VND 5.000 (20 cent) for this small piece. Every day after school or work, on the way back home, stopping by a Bo Bia Ngot vendor is such a peaceful feeling. For the foreign tourists, trying Bo bia ngot on a beautiful day walking around the city will certainly make the journey less tiring. If you ever come to Vietnam, try this cheap yet wonderful street food, and you will not regret. I decided to book air tickets to return Hoian for the 3rd time on a day of mid-October. However, this is the first time of mine to visit the enchanting town during its rainy season and especially when reading the weather forecast news warning that if central Vietnam would be anyone’s travel plans over the next few days, they may want to consider delaying the travel — or, at least, keep updated to the latest information pertaining to the weather due to the effects from Typhoon Khanun.” (Boarding Area). Having been kept updated by the local weather forecast channel about the weak influence of this storm and believing that the daily rain will not dilute the beauty of this region, I still started my trip as planned and was so lucky to enjoy Hoian without rain or storm but with a pleasantly sunny and cool weather throughout my chilling days. After strolling around the old streets of Hoi An, I thought of doing something else near the town for more fun experiences. My great day was to rent a bike and ride around on two wheels to visit Thanh Ha Pottery Village, Bay Mau Palm Forest and relax by An Bang Beach. Finishing a nice breakfast with Mi Quang (Quang Noodle with shrimp and pork), I headed 3 kilometers out of Hoian town to Thanh Ha Terracotta Park and Pottery Village to see the historical village and made a pottery on my own as a souvernir. The Thanh Ha village was famous for its pottery, bricks and tiles. You will be amazed to know the unique Yin – Yang tiles which can still be seen on many roofs in the old city of Hoi An were made from this old village. Coming to the terracotta museum, you will have a chance to see the whole building of red bricks and clay in the region. I must admit that I was lost in the World Square garden of miniature of iconic monuments from all over the world. This was really a great way to learn new places and to check my memory. Besides world famousTaj Mahal, Statue of Liberty, Stonehenge, Sydney Opera House, Pyramids, the Whitehouse, the Angkor Wat, I figured out the little replica of Hoi An Old Town with lovely old houses which were all made by clay and by the artisans in village. Though the indoor exhibition was quite attractive with objects and images about the long history development of 500 year history at Thanh Ha, I could not stand going down to the outdoor area where I can see the nice hand-made pottery products and made one by myself. Needless to say, this is an ideal site for both adults and children where you can create any masterpieces of your imagination. Having made the pottery without previous knowledge and experience but thanks to the great help of the nice artisan, the vase/pot came out surprisingly nice and it cost only 30,000 VND for this worth. Leaving the Thanh Ha village, I continued my day trip to Bay Mau Nipa Palm Forest where is regarded as the Little Mekong inside Hoian. Located 5 km from Hoian and surrounded by water of 3 major rivers in Hoian: Thu Bon River, Truong Giang River and De Vong River, the hidden coconut forest is really a wonderful destination for tourists to sit in the basket boat and go through the natural coconut waterway. In the past, the forest was an important historical where the guerrilla force relied on coconut forests to cause more damage to the enemy in wars and became a place of shelter, refuge to many officials. Nowadays, it is really nice place for people to explore the tranquil coconut palm while seeing the sunset at Thu Bon River. Welcomed me on boat, the friendly boat lady gave me an amazing gift made of the coconut leave, that is the ring with shape of a grasshopper! The rowing boat went through the forest and along the river for around 30 minutes. At the end of the ride, I was astonished again by the unique performance of a boat man right in his basket boat while enjoying a great round by my boat’s old lady that was a little dizzy but so much fun. The end of my day trip today was An Bang Beach, a lovely beach that is only 3 kilometers from the town and it is where you will find less vendors, more peace with clean water, smooth sand, gentel waves and pure atmosphere. While the Hoian ancient town is peaceful, the beach is somehow vibrant by the pace of life showing on a huge number of bamboo basket boats along the beach. Like in Bay Mau forest, these boats are still used as a mafor means of fishing for daily life. As the ideal time for swimming at Hoian beach is from April to September during the summer of Central, I just stopped at An Bang Beach to have a big fresh seafood dinner that definitely satisfied a hungry soul like me. Though the trip was taken during the rainy season, I enjoyed myself very much in a great weather. So my best advice for anyone who is planning to Hoian these days would be to get updates from local weather channels, book accommodation through any channels that allows for late cancellations or for last-minute delay until the weather is better and take advice from locals where living right at place. It is certain that you can even still had good days while during rainy time. Therefore, I believe you may also have a lot of fun experience to Hoian and do not hesitate to share with me your great time there! Autumn is the most beautiful season and is the best time to visit Hanoi. When you visit Hanoi at this period (from August to October), the weather is not so hot in the morning and a little cool at night, light rain sometimes. In this season, you will feel Hanoi as a beauty of a young and vunerable girl. It is very difficult to use any words to describe the fragile beauty of autumn in Hanoi. Because of this beauty, the Emperor decided to give this “beautiful girl” as a natural “gift” – Com (Green Sticky Rice or Green young rice) for Viet people. 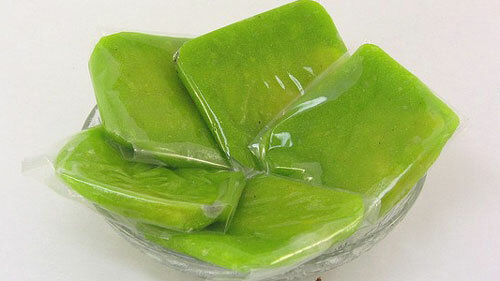 With its green color and small size, it is the most fresh and beautiful food you have ever try during your life. The best way to enjoy Com is used it with ripe bananas. Believe me! you will not forget this mixed flavour. Nowadays, this refined food is usually sold by vendors, who day by day walk through small streets or sit on the sidewalks with their shoulder pole and hangers. Moreover, Cốm is used by houseworkers as an ingredient in daily meals. Some dishes that can be made from Green Sticky Rice are: chicken stewed with herbs and Green Sticky Rice, fried shrimp coated in Green Sticky Rice, Green Sticky Rice sweet soup (Chè Cốm) or even Green Sticky Rice ice cream. Cốm is also an essential ingredient in making Green Rice Cake, a must have present in engagement ceremony of Vietnamese people. Before each wedding, a man’s family have to bring offerings to the woman’s one in order to ask for permission for their wedding. Along with Green Rice Cake, Xu Xe Cake and betel nut are presents that used to hope for a bright and happy future of the brides and grooms. Green Sticky Rice is so special that it makes every person living far away misses their hometown. In addition, Cốm definitely can satisfy and pamper the most fastidious travelers who ever came to Hanoi. You can not bring the fresh green young rice back to home but you can buy some products made from it as speical souvenir. However, most of real cake/candy made from Com should be used in 4 days to keep their real flavour. I hope that after reading my post, com will be on your must-try food list in Vietnam. Then, you will at least one time try this special food and enjoy it in the best way. Lotus seeds are harvested when the seed head of the lotus is ripe or nearly ripe and the latter is harvested when the seed head is still fully green but with almost fully developed seeds. At harvest, the bitter-tasting germ of most seeds is removed using a needle. It is a healthy ingredient with low in saturated fat, cholesterol, and sodium, and are a good source of protein. The Hanoians have many ways to use the lotus seeds in cooking. 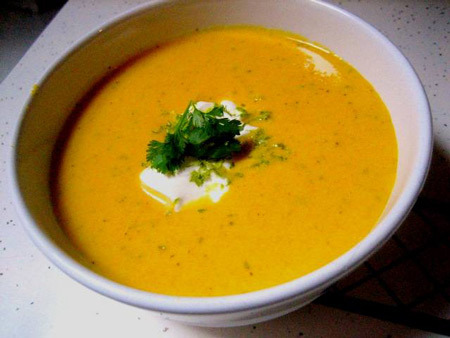 Pumpkin and lotus seeds soup is a perfect starter for your dinner. For the main course, you can order the lotus rice. Rice mixing with lotus seeds, wrapped in the fresh lotus leaves then steamed to be well-done. The fragrance from the lotus leaves that brings comfy feelings. It is also sure going into the favourite list of vegetarians. 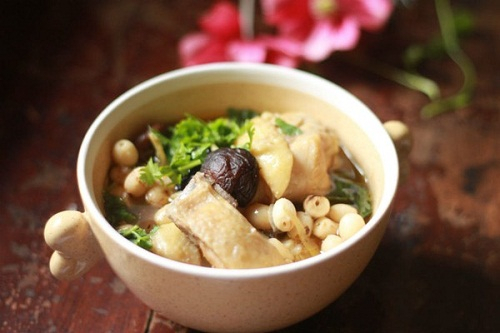 Chicken, mushroom and lotus seeds slow cooked is a high nutrient receipt that is considered good for the recovering patients and helps to have a beauty sleep. It will be a mistake if the desert from the lotus seeds does not come to this list. Fresh lotus seeds stuffed inside the fresh, peel-off longan, that makes the dish looks like the real fruit but with eatable seeds. Added with ice, sugar syrup and a bit fragrance from jasmine flowers, you feel like you’re eating not a dessert, but the spirit of Hanoi. Though Hanoi is a busy city, it is surrounded by beautiful green fields of rice. Immature rice kernel is harvested and roasted over very low heat then pounded in a mortar and pestle until flattened, then to be served with coconut. 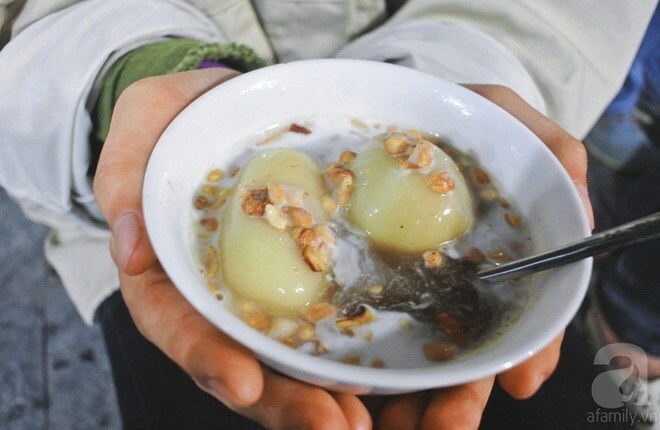 In a more rustic way, people eat cốm with ripe banana. Cốm is also used to make other dishes such as xôi cốm (steam sticky rice), chè cốm (sweet soup), chả cốm (the green young rice mix with pork paste, flatten shaped then fried). Hanoi is very famous with bánh cốm ( the green rice cake). Steamed, mashed green beans mix with fresh shredded coconut, sugar and covered by the rice flour. It tastes sweet but not too much, quite sticky and will be a perfect match with a cup of Vietnamese hot tea in the afternoon. The traditionally baked moon cake has about 10 ingredients inside: cashew nuts, pumpkin seeds, sesame seeds or almond, chicken floss, Chinese sausages, lime leaves, lotus seeds, winter melon dried jam, etc. The non-baked version is usually going with vegetarian ingredients, such as taro, lotus seeds, green beans, young rice cake, coconut, etc. 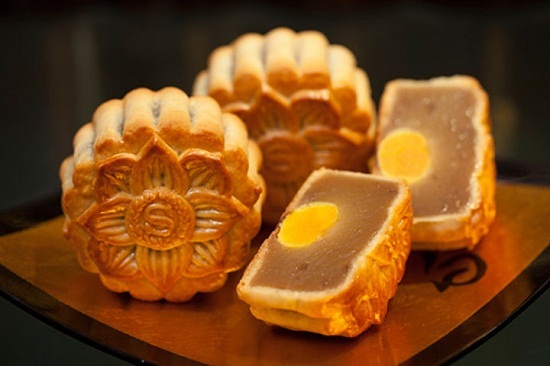 The moon cake nowadays has been upgraded to a more luxurious version with salted eggs inside. Is has been not only for eating, people are using the moon cake as a gift for their family and friends.